Rubber Room Ramblings: RELAX AND CREATE RETREAT TIME IS NEAR! 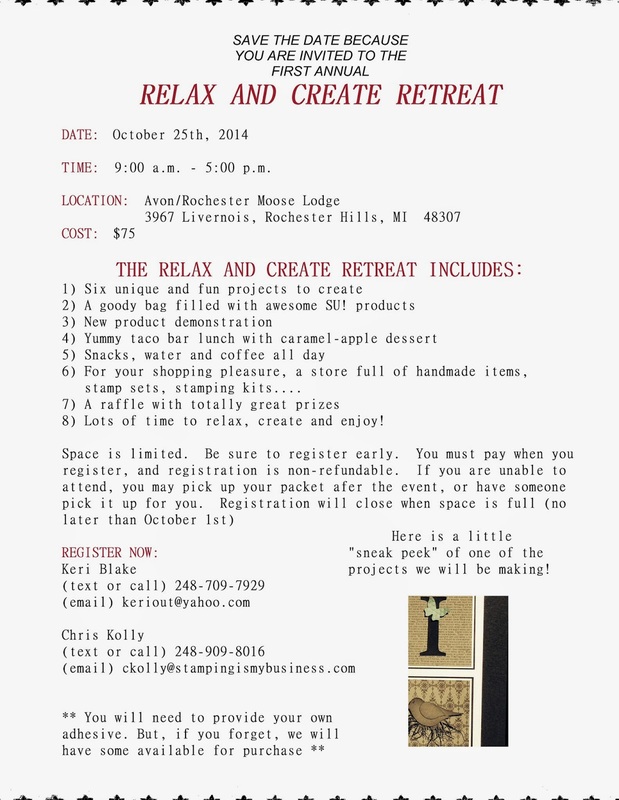 RELAX AND CREATE RETREAT TIME IS NEAR! Are you a 3D fan? Do you love stamping time with friends? Perhaps you need holiday gift ideas? Maybe you want to purchase a few handmade gifts or retired stamp sets? Is seeing new product demonstrations on your bucket list? Whatever your creative needs are, the Relax and Create Retreat is the answer! Here are all the details. Please share this flyer with your girlfriends, make a plan to attend and register for the perfect day! CHEERS TO LOVE FROM HELENA! MORE OF CAROLINE'S CREATIVE SWAPS! METRO TYPE ALPHABET FROM STAMPIN' UP! PROJECT LIFE ITEMS NOW AVAILABLE! TWO MONTHS OF PAPER PUMPKIN AT 50% OFF! RUBBER ROOM UNSCRIPTED IS THIS FRIDAY! TOMORROW, JULY 10TH, IS THE DAY!! HEADS UP FOR MORE SAVINGS! NEW STAMPIN' UP! WEEKLY DEALS HAVE ARRIVED! CHRISTMAS BLISS PHOTOPOLYMER STAMP SET! STAMPIN' UP! HAS FREE DSP IN JULY!